The first ‘Encounters with Circus and Its Others’ (CAIO) conference took place in Montreal in 2016 alongside the Montréal Complètement Cirque Festival. In 2016, three organizers and 31 participants queried how circus wrangles with issues of gender, globalization, race, queer experiences, and the way animal bodies are read on stage. Followed by a flurry of conversation, research, and the 2018 (free, downloadable) online publication of a special double issue of Performance Matters (a peer-reviewed journal) entirely devoted to circus arts inquiry, a second conference seemed both necessary and inevitable. The organizers agreed that the conference should be aligned with a circus festival, both for the benefit of the participants – who are able to see and discuss circus performance – but also to encourage the inclusion of circus performers, directors, creators and producers who might not otherwise travel to an ostensibly academic gathering. This time, the conference was held in Prague during the 15thannual Letní Letná international festival of contemporary circus and theatre. With five co-organizers and 48 presenters over three days, the conference was an intensive immersion into the ideas, questions and thoughts occupying today’s circus thinkers. In addition to the presenters, many circus artists, creators, teachers and researchers travelled to attend the conference, offering a welcome contribution from diverse circus communities. Who am I and why was I there? It seems relevant to make explicit my interest and involvement with this conference. Arriving to circus arts through dance, I attended the Ecole de Cirque de Quebec and, alongside many years of creating and performing aerial arts, also became certified as a coach — in a program which I now instruct — through Montreal’s Ecole national de cirque. Interest in circus education has brought me to graduate studies, where I research circus arts education. I participated in the first CAIO conference and am grateful to have also been invited to participate in this second edition as a presenter, conference chair and workshop co-facilitator. Enthusiastic about both the practice and theory of circus arts, I find the framework and curation of CAIO both nourishing and inspiring. It is rare in academic presentations that one does not have to inform the audience about the essentials of circus arts, describing the different eras and movements. 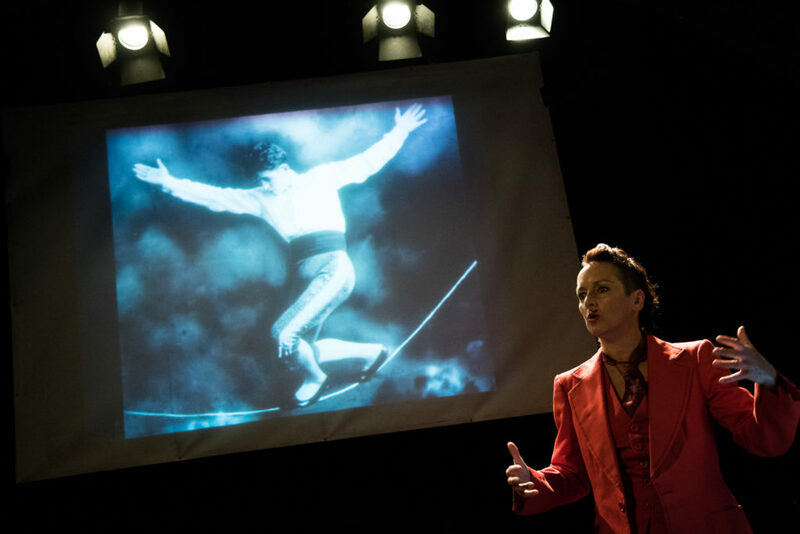 When presenting to circus artists from an academic perspective, it is often useful to explain the fundamentals of research – how different methods are used and why certain theorists offer insight. 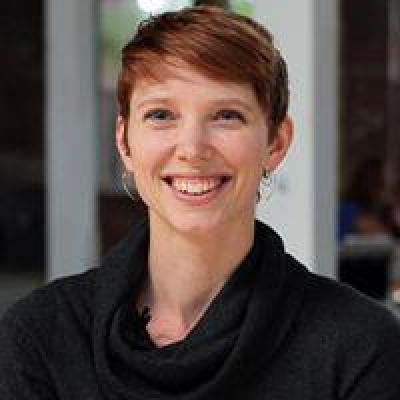 By contrast, CAIO is a rare opportunity to discuss and exchange with thinkers who are knowledgeable and excited about both circus arts and research methods, encouraging enriching conversation and connections. The conference participants came from all over Europe, North America and South America, bringing a wide range of experiences (producers, educators, social circus champions, performance studies scholars, education scholars, queer theorists, disability activists, gender theorists, Indigenous studies researchers, and people associated with contemporary and traditional circus practices, etc.). Co-organized by Veronika Stefanova from the Czech contemporary circus hub Cirqueon, Czech circus artists were invited, participated in panel discussions, and were consistently present in the audience. Conversation and networking during the luxurious coffee and lunch breaks occurred regularly between people working in all aspects of circus performance, education and research. Because of the international nature of the conference, panel sessions frequently offered glimpses of perspectives from different countries around a common issue. For instance, during a panel about gender in circus arts the audience heard about women in Australian contemporary circus from Dr. Kristy Seymour, performances by all-female circus collectives in France from Dr. Marion Guyez, a case-study analysis of gendered language in a British circus newsletter from Martha Harrison, and an exploration of the gendered history of pole dancing from James Green. Similarly, panels with multiple presenters explored social circus from many angles (from Ian Jagel’s interrogations of philanthropy, to Simone O’Brien’s call to integrate indigenous inspiration into Indigenous-focused programs, to Mathilde Perallat’s investigation of performance undertaken in social circus programs). With a wealth of provocative and enticing topics, individual summaries here will only fall far short of the actual impact. I strongly encourage interested readers to take advantage of the CAIO website which lists not only the program, but all of the presenter bios and short descriptions of their topics. Several themes recurred repeatedly, with speakers drawing upon each other’s presentations to make links with their own offer. The idea of looking for ‘what is missing’ became a conference theme as it repeatedly surfaced throughout discussions and presentations. Looking for missing elements was specifically called out by Dr. Olga Lucia Sorzano as she explored why circus histories consistently privilege a Eurocentric worldview, continued through Katharine Kavanaugh’s entreaty for circus researchers to go to circus practitioners wherever they might be practicing, and by my own questions about what content is left out of circus school curricula. Many conference presenters felt that the conference itself was missing important voices, especially those who were working during summer months, had limited finances, required special assistance, more traditional circus practitioners, and people bringing perspectives from more diverse cultural experiences of circus arts. The organizers took suggestions from participants under advisement for the next gathering. Another theme to surface was that of hospitality; Michelle Man explored a “hospitality of movement” as a way of understanding acrobatic creation in circus arts, while Stephen Caldwell presented a manifesto of radical hospitality as a means of continuing the work of social circus pioneer Reg Bolton, enacting a phenomenological experience through circus arts practice, and becoming vulnerable in order to find strength. The ideas of ‘hospitality,’ welcoming difference and inviting participation recurred through discussion and response to the conference. Several other themes, such as authorship and creative ownership in circus (Dr. Agathe Dumont, Sylvain Lavoie, Ante Ursic), uncovering historical connections to circus practice (Dr. Camilla Damkjaer, Kate Holmes, Dr. Susann Lewerenz, Stav Meishar), and questioning the way different bodies can participate in – and experience – circus arts (Dr. Tina Carter, Alisan Funk, Erin Ball and Dr. Keren Zaionz) resonated among participants, as the topics continually resurfaced. It is impossible, in this short article, to capture the whirlwind intensity of the CAIO conference or to name every important idea. With overlapping sessions, there was more content than even a single participant could take in (akin, perhaps to the three-ring experience). From workshops to brainstorming ideas about improving gender representation in circus arts, to roundtable discussions, to a closing session that included open thoughts from all participants and attendees about their experiences, ideas, hopes and critiques, the CAIO conference can sincerely offer a platform for informed discussion for those interested in any aspect of circus arts. 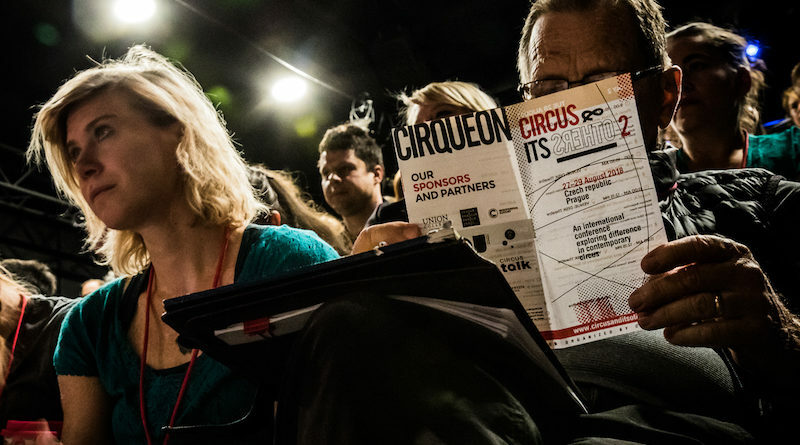 Conferences such as CAIO indicate that circus practitioners are increasingly eager to engage in researching the circus arts, and address problems or questions that they have about the arts that they love. The takeaway from this conference is that there are many people involved with circus arts practice who are ravenous to also deeply discuss the implications of circus performance, education, practice, and spectatorship. Academic research into circus arts, if this conference is a litmus test, seems to be largely driven by those with direct experience in circus arts who also aim to contribute back into circus performance and practice. 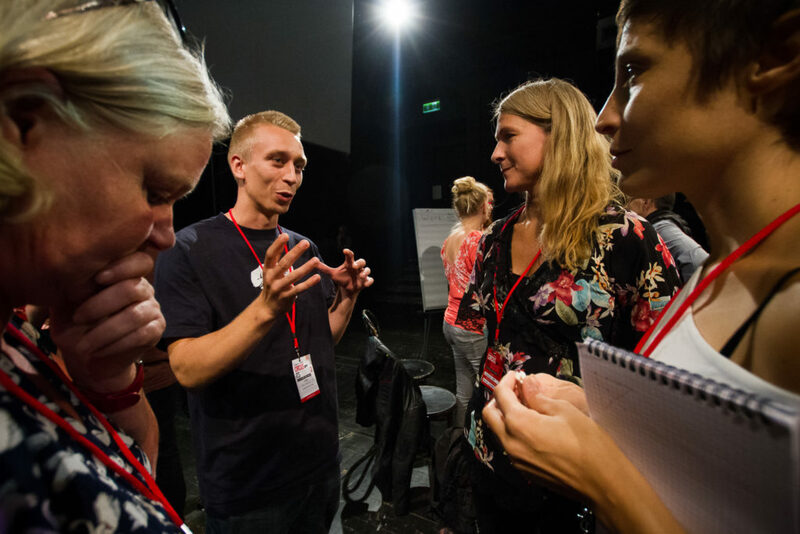 The welcoming atmosphere can be seen as an invitation to those interested in pursuing circus research, or interested in how circus research can directly benefit circus arts practices, to stay tuned for the next edition. Feature photo courtesy of David Konecny. Loes Van Schiajk and Rodney A. Huey pictured.